Join Us As We Partner with Building Homes for Heroes! 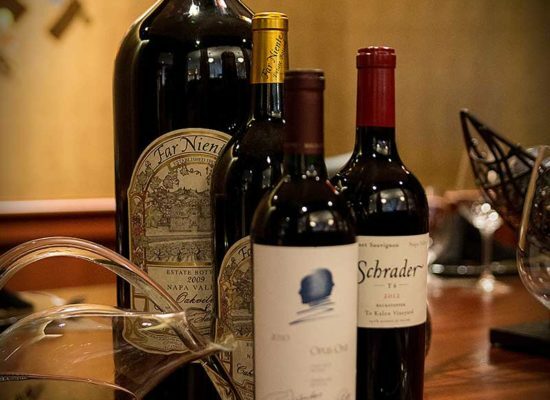 Each October, Mickey Mantle’s Steakhouse partners with an organization with the goal of giving back to the community that has been our home since 2000. This year, we are delighted to announce our partnership with Building Homes for Heroes! Building Homes for Heroes is a national non-profit, non-partisan 501© (3) organization that was founded in 2006 with the purpose of rebuilding lives and supporting the brave service men and women who were injured while serving the country during the time of the wars in Iraq or Afghanistan. The organization accomplishes this lofty goal by gifting mortgage-free homes that meet the needs of the people who were injured while serving our country. Additionally, Building Homes for Heroes has added programs such as financial planning services, family funding and emergency support in order to provide these new home owners with the guidance and advice needed to plan for a successful future. It is important to make sure you know that your money is going to a reputable organization when donating to charity. Organizational efficiency and sound fiscal responsibility are extremely important to Building Homes for Heroes. Neither the CEO nor its board members are compensated for their duties. Fundraising and administrative costs are kept to a minimum with a small percentage of funds allocated to overhead costs. These measures mean that for fiscal year 2016, Building Homes for Heroes was able to hold a program service percentage of 92.82% while gifting 29 homes to wounded veterans! View up to date financial information here. You can also view a list of service people who have been gifted mortgage-free homes by Building Homes for Heroes here. The goal for 2017 is to gift 33 homes. Now for the big question, HOW CAN YOU HELP? 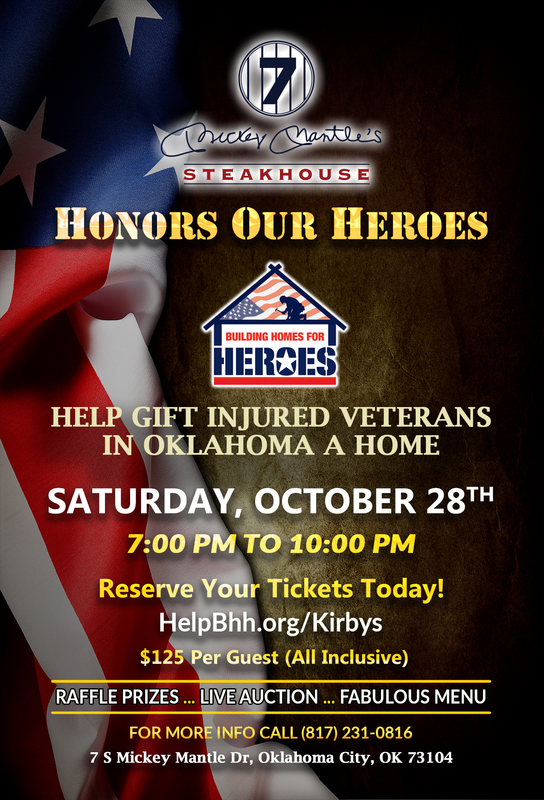 We’ve made it very simple, purchase a ticket to the Building Homes for Heroes Dinner on October 28th. One hundred percent of the proceeds from these ticket sales will go directly to Building Homes for Heroes in the Oklahoma City area! There is also an option to add an additional donation during ticket purchase. Why? 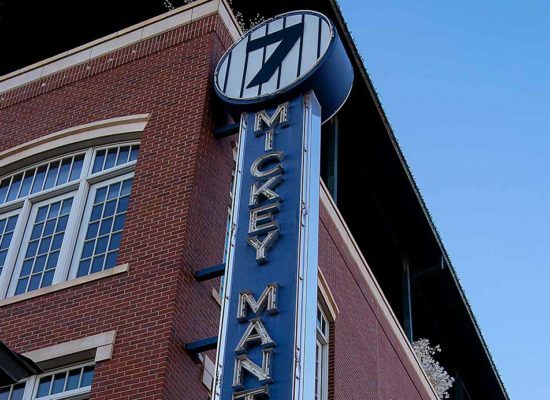 Enjoy a delicious 4 course dinner of special items created by the Mickey Mantle’s Steakhouse culinary team in order to raise funds for Building Homes for Heroes in Oklahoma City. How Much? 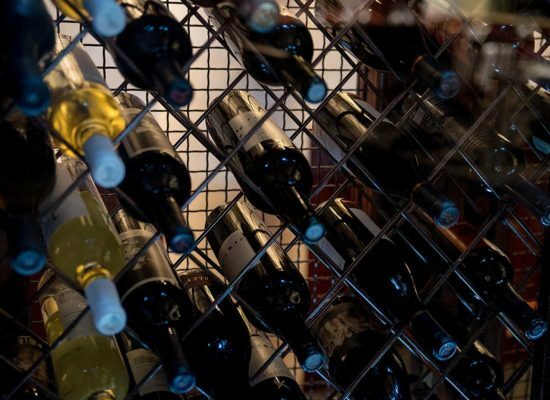 $125 per person. All inclusive. Tickets can be purchased by visiting HelpBHH.org/Kirbys then click on the image to be redirected to the order form. 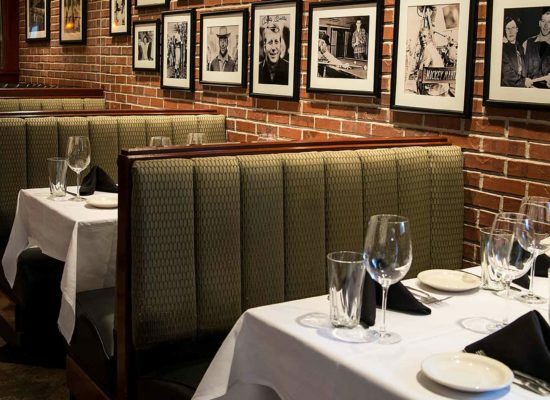 Be sure to select Mickey Mantle’s Steakhouse as the dinner location. Our sister steakhouses in Texas are also partnering with Building Homes for Heroes on additional dinners. Feel free to share with your Texas friends and family! Bacon Wrapped Shrimp – Pasilla Cream – Citrus Relish. Gorgonzola –Crispy Proscuitto – Caramelized Onion . Bourbon Portobello Cream – Black Garlic Compound Butter – Duck Fat Smashed Potatoes. Blueberry Chocolate Torte – House Made Crème Fraiche. Throughout the month we will be sharing information about this incredible organization in the hopes of increasing awareness for this worthwhile cause. Follow us on Facebook, Twitter and Instagram, every like, comment and share helps bring attention to wounded veterans! Make sure you are using #GiveWithMickeys in your shared posts! Looking to get more involved? Click to find out how to help.